Hi Enrico Fermi (Septyembre 29, 1901 – Nobyembre 28, 1954) usa nga Italyano nga fisisita nga kilalado tungod han iya trabaho han paghimo han syahan nga nuclear reactor, ngan tungod han iya mga amot han pagpadukwag ha quantum nga teorya, nuclear ngan particle nga fisika, ngan statistical mechanics. Hi Fermi ginpremyohan han Premyo Nobel ha Fisika han 1938 tungod han iya trabaho ha larangan han induced radioactivity. An FERMIAC, usa ka analog nga gamit nga inimbento ni Enrico Fermi para igimplementar han pag-aram han pagbalhin hin neutron. (ha Italian) Introduzione alla Fisica Atomica. Bologna: N. Zanichelli. 1928. OCLC 9653646. (ha Italian) Fisica per i Licei. Bologna: N. Zanichelli. 1929. OCLC 9653646. (ha Italian) Molecole e cristalli. Bologna: N. Zanichelli. 1934. OCLC 19918218. (ha Italian) Fisica per Istituti Tecnici. Bologna: N. Zanichelli. 1938. (ha Italian) Fisica per Licei Scientifici. Bologna: N. Zanichelli. 1938. Alison, Samuel King (1957). "Enrico Fermi, 1901–1954". Biographical Memoir (National Academy of Sciences) 30: 125–155. OCLC 11772127. Amaldi, Edoardo (2001). "Commemoration of the Academy Fellow Enrico Fermi". In Bernardini, C.; Bonolis, Luisa. Enrico Fermi: His Work and Legacy. Bologna: Società Italiana di Fisica: Springer. pp. 23–35. ISBN 88-7438-015-1. OCLC 56686431. Bertotti, Bruno (2001). "Fermi's Coordinates and the Principle of Equivalence". In Bernardini, C.; Bonolis, Luisa. Enrico Fermi: His Work and Legacy. Bologna: Società Italiana di Fisica: Springer. pp. 115–125. ISBN 88-7438-015-1. OCLC 56686431.
Cooper, Dan (1999). Enrico Fermi: And the Revolutions in Modern physics. New York: Oxford University Press. ISBN 0-19-511762-X. OCLC 39508200. http://books.google.com/books/about/Enrico_Fermi.html?id=JK94sqLFsNsC. Fermi, Enrico (2004). "The Future of Nuclear Physics". In Cronin, J.W. 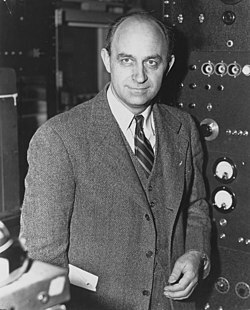 Fermi Remembered. Chicago: University of Chicago Press. ISBN 0-226-12111-9. Hoff, Richard (23 January 1978). "Production of Eisteinium and Fermium in Nuclear Explosions". In Seaborg, Glenn T. Proceedings of the Symposium Commemorating the 25th Anniversary of Elements 99 and 100. Los Alamos: Los Alamos National Laboratory. pp. 39–49. Report LBL-7701. http://www.escholarship.org/uc/item/92g2p7cd.pdf. Hewlett, Richard G.; Anderson, Oscar E. (1962). The New World, 1939–1946. University Park: Pennsylvania State University Press. ISBN 0-520-07186-7. OCLC 637004643. http://www.governmentattic.org/5docs/TheNewWorld1939-1946.pdf. Hucke, Matt; Bielski, Ursula (1999). Graveyards of Chicago: The People, History, Art, and Lore of Cook County Cemeteries. Chicago: Lake Claremont Press. ISBN 0-9642426-4-8. OCLC 42849992. Jacob, Maurice; Maiani, Luciano (2001). "The Scientific Legacy of Fermi in Particle Physics". In Bernardini, C.; Bonolis, Luisa. Enrico Fermi: His Work and Legacy. Bologna: Società Italiana di Fisica: Springer. pp. 241–270. ISBN 88-7438-015-1. OCLC 56686431. Jones, Eric M. (March 1985). "Where is Everybody? ", An Account of Fermi's Question. Los Alamos: Los Alamos National Laboratory. OCLC 4434691994. LA-10311-MS. http://www.fas.org/sgp/othergov/doe/lanl/la-10311-ms.pdf. Ricci, Renato Angelo (2001). "Fermi's Last Lessons". In Bernardini, C.; Bonolis, Luisa. Enrico Fermi: His Work and Legacy. Bologna: Società Italiana di Fisica: Springer. pp. 286–313. ISBN 88-7438-015-1. OCLC 56686431. Salvini, Giorgio (2001). "Enrico Fermi: His Life and Comment on his Work". In Bernardini, C.; Bonolis, Luisa. Enrico Fermi: His Work and Legacy. Bologna: Società Italiana di Fisica: Springer. pp. 1–20. ISBN 88-7438-015-1. OCLC 56686431. Seaborg, Glenn T. (23 January 1978). "Introductory Remarks". In Seaborg, Glenn T. Proceedings of the Symposium Commemorating the 25th Anniversary of Elements 99 and 100. Los Alamos: Los Alamos National Laboratory. pp. 1–3. Report LBL-7701. http://www.escholarship.org/uc/item/92g2p7cd.pdf. Snow, C. P. (1981). The Physicists: A Generation that Changed the World. Boston: Little Brown. ISBN 1-84232-436-5. OCLC 7722354. Von Baeyer, H. C. (1993). The Fermi Solution: Essays on Science. New York: Random House. ISBN 0-679-40031-1. OCLC 27266040. Ini nga pakli kataposan nga ginliwat dida han 04:04, 1 Pebrero 2015.